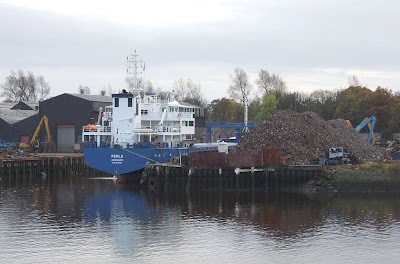 The scrapyard at Renfrew occupies one of the the River Clyde's many former shipyard sites, in this case that which previously belonged to the Lobnitz yard, and the basin where ships load the scrap metal being taken generally to Spanish ports, is known as Lobnitz Basin. It is at that berth that the German coaster PERLE is seen, ready to start loading. A 4,270 tonne deadweight coaster, this ship is owned by Wessels. PERLE was built in 1998 at the Rousse shipyard in Bulgaria, and is 89.90 metres in length.